192 Beacon is located on the north side of Beacon, between Clarendon and Dartmouth, with 190 Beacon to the east and 194 Beacon to the west. 192 Beacon was built ca. 1862, one of a symmetrical pair of houses (192-194 Beacon). 192 Beacon was built as the home of Charles Storer Storrow and his wife, Lydia (Jackson) Storrow, on land he purchased on April 5, 1861, from the Boston and Roxbury Mill Corporation. They previously had lived at 34 Mt. Vernon and before that in Lawrence (where he served as the first mayor in 1853). Click here for an index to the deeds for 192 Beacon. An engineer by training, in 1845, at the request of Abbott Lawrence, he undertook the construction of the dams and canals of the Essex Company on the Merrimac River in Lawrence. He remained as engineer and treasurer of the company until 1882, and served as president and a director until 1889. The Storrows’ three surviving unmarried children – Charles Storrow, Samuel Storrow, and Lydia Jackson Storrow – lived with them. Their oldest child, James Jackson Storrow, an attorney, married in August of 1861 to Annie Maria Perry and they lived at 10 Joy and then 44 Pinckney. Samuel Storrow was killed in action at Averysboro, North Carolina, in March of 1865. Charles Storrow, a commission merchant, married in March of 1866 to Martha Robinson Cabot. After their marriage, they lived in Brookline. Lydia Storrow married in November of 1880 to Ebenezer Dale, Jr., a dry goods merchant and textile mill operator. After their marriage, they lived at 13 Hereford. Lydia (Jackson) Storrow died in February of 1889. Ebenezer Dale died in September of 1889, and Lydia (Storrow) Dale joined her father at 192 Beacon soon thereafter. Charles Storrow died in April of 1904. After his death, Lydia (Storrow) Dale moved to 130 St. Marys. 192 Beacon was not listed in the 1905 Blue Book. On April 25, 1905, 192 Beacon was purchased from J. Sumner Draper as the home of Eleanor Anne Brune (Shattuck) Whiteside, the widow of Alexander Whiteside, and their son, Alexander Whiteside, Jr., a lawyer. They previously had lived at 6 Newbury. The property was purchased by a trust established under the will of her mother, Anne Henrietta (Brune) Shattuck, wife of George Cheyne Shattuck, of which Eleanor Whiteside’s brother, Dr. Frederick Cheever Shattuck, and her son, Alexander Whiteside, Jr., were the trustees. In 1908. Eleanor Whiteside and Alexander Whiteside were joined at 192 Beacon by James Donald Cameron Bradley, a boarder. He had graduated from Harvard in 1906 and then worked for a year in Harrisburg, Pennsylvania. He returned to Boston where he became a broker. By 1909, he had moved to 51 Hereford. Alexander Whiteside, Jr., married in May of 1909 to Ethel Stockton. They lived at 192 Beacon with his mother until about 1912, but had moved to 323 Beacon by 1913. In June of 1911, Eleanor Whiteside’s trust purchased 194 Beacon. Eleanor Whiteside died in January of 1918. 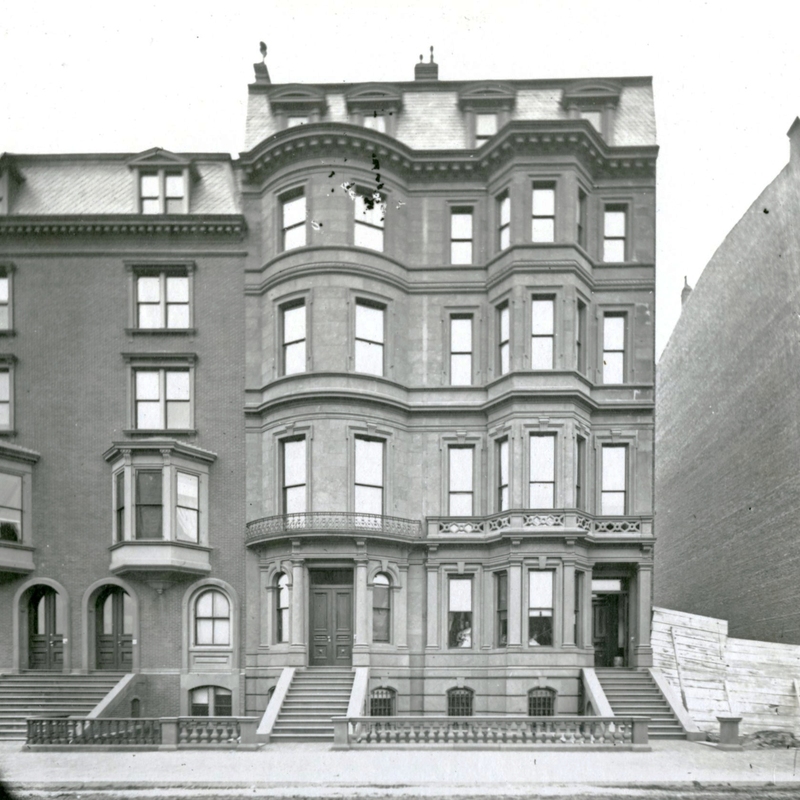 During the 1918-1919 winter season, 192 Beacon was the home of James Jackson Storrow, III, and his wife, Margaret Randolph (Rotch) Storrow. 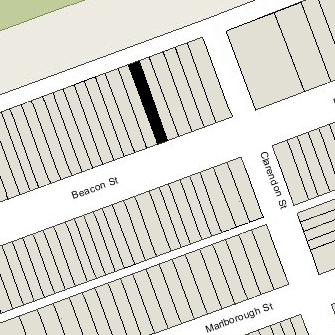 They previously had lived at 265 Clarendon. James Jackson Storrow, III, was the great-grandson of Charles Storer Storrow, for whom 192 Beacon was built. He was serving as a lieutenant in the US Navy; he subsequently was an electrical engineer with Boston Edison until 1926, when he became trustee of the family’s property after his father’s death. By 1920, they had moved to 175 Bay State Road. During the 1919-1920 winter season, 192 Beacon was the home of William Watson Caswell and his wife, Pauline (Starr) Caswell. They previously had lived at 265 Clarendon. William Caswell had been a manufacturer of ramie thread (used extensively in gas lighting mantles) and later served as treasurer of Arthur D. Little, Inc.
By 1921, they had moved to 251 Beacon. On August 16, 1920, 192 Beacon was purchased from the heirs of Eleanor Whiteside by Ada Elizabeth (Hancock) Dorr, the wife of cotton broker Alfred Dorr. 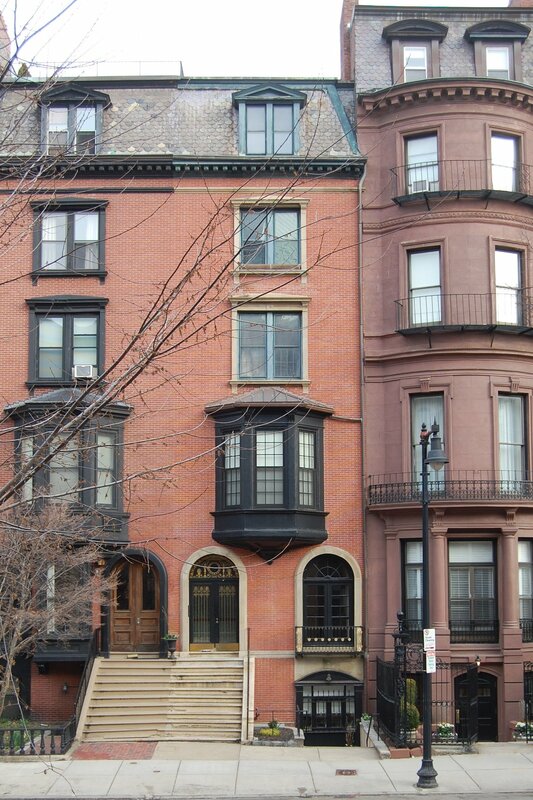 They previously had lived in an apartment 9 Massachusetts Avenue. Their son, Hancock Dorr, lived with them. He was an insurance broker. He married in June of 1933 to Hester Swain; after their marriage, they lived at 192 Beacon with his parents. Alfred Dorr died in April of 1934. Ada Dorr, and Hancock and Hester Dorr, continued to live at 192 Beacon until about 1937. 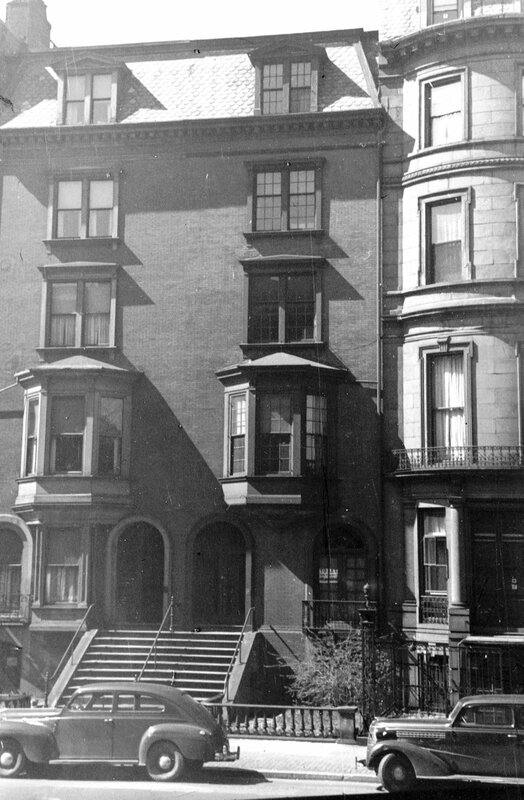 By 1938, Hancock and Hester Dorr had moved to Newton and Ada Dorr had moved to an apartment at 31 Marlborough. Ada Dorr continued to own 192 Beacon and lease it to others. By 1938, it was the home of Henry Lee Higginson and his wife, Dorothy (Hedden) Fulton Higginson. They previously had lived in Newton. He owned a dairy farm in Lincoln, and later became a writer and poet. They continued to live there until about 1942, when he joined the US Navy and they moved to 5 Gloucester. In May of 1943, Ada Dorr applied for permission to convert the house from a single-family dwelling into a lodging house. By 1943, 192 Beacon was the home of Helen M. Webster, the widow of George Webster, who operated it as a lodging house. She previously had lived at 38 Westland Avenue. She continued to live there in 1945, but moved thereafter. On March 21, 1945, 192 Beacon was purchased from Ada Dorr by Jack A. Gordon. In April of 1945, he filed for (and subsequently received) permission to convert the house from a single-family dwelling into four apartments and a doctor’s office on the basement level with a new separate entrance. Plans for the remodeling, designed by architect Saul E. Moffie, are included in the City of Boston Blueprints Collection in the Boston Public Library’s Arts Department (reference BIN R-56). The property subsequently changed hands, and by the mid-1950s, the occupancy had been increased to into five apartments and a doctor’s office. On September 13, 1956, 192 Beacon was acquired by Charles H. Bradford, Edward H. Bradford, and George R. Harding, trustees of the Bradford Realty Trust. In October of 1956, they filed for (and subsequently received) permission to add a story to the rear ell and to change the occupancy to six apartments. On June 21, 1963, 192 Beacon was purchased from the Bradford Realty Trust by attorney and real estate dealer Peter N. Kinder. He and his wife, Elizabeth, lived in one of the apartments. By the mid-1960s, they also owned 48 Hereford, which they operated as a lodging house. On May 10, 1972, 192 Beacon was acquired from Peter Kinder by Arthur M. Cappon, trustee of the AMC Realty Trust. On September 19. 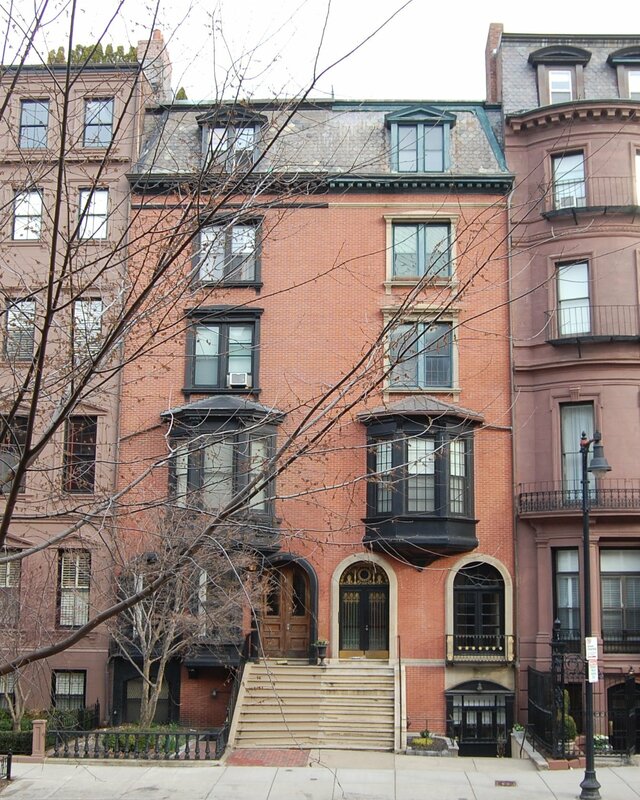 1976, he converted the property into five condominium units, the 192 Beacon Street Condominium.